Summer so far is warm and dry, but there is lots of sun, so all the plants grew and flowered well, and birds and mammals thrived. One thing the hot weather showed up was the way natural vegetation looks after itself in the dry whereas mowed grass just dies into a brown desert. For some reason verges were left unmown for quite a while in June and the wild flowers flourished by the roadside, though there was a mowing later on dry ground which made everything very dead-looking. There was a delay in mowing the churchyard too, reminding us that a beautiful variety of ancient plants like pignut grow there and are routinely mown to nothing in the interests of tidiness. It has been a lovely classic English summer so far, but the dry weather will begin to take its toll if this weather continues as forecast. Wild life is pretty resilient but there are signs of a much reduced fruit crop: fruit trees want water. Some things that have benefited are the wonderful butterflies which love the sun, and the dragonflies and damselflies wherever there is water. Hazel is the Celtic calendar tree for August. It is a tree I love, because it is so common and appears everywhere, adds great beauty at times of year when you need it, and has all kinds of uses. The hazel in mythology is a tree of magic and divination. Its use in divination is not entirely mythological, however. It is traditionally used for water divining. A forked hazel twig held loosely in the hands will suddenly bend and twist as you carry it. This is believed to happen when crossing a source of water. I believe it, as my cynical old farmer father used a diviner to find the source of springs on the farm. Hazel is the tree of the fairies, and a hazel wand can perform all kinds of magic! One Celtic legend tells of nuts falling from a beautiful hazel into a stream and being eaten by salmon, causing the orange spots on their skin. Hazel nuts represent a concentration of wisdom and insight. The medieval nun Julian of Norwich meditated on a hazel nut. We know hazel as a hedgerow shrub, but in open places it can grow into a large tree. It likes poor soil and grows near streams in wild places, so you can find it all over the British Isles. One of the reasons we think of it as a small tree is that is was often coppiced – cut down and allowed to regrow. Hazel takes particularly well to coppicing, partly because it naturally coppices itself! There is often not a main trunk on a hazel, but lots of small trunks growing from one root. Even if it has a main trunk, it will often have side shoots. These often grow nice and straight and when cut can easily be made into bean poles, walking sticks, Morris men’s sticks, line props or the framework for furniture and buildings. Hazel can be split and bent, so it made “wattles” for fencing, and rods to peg down thatch. So, hazels were really useful and encouraged to grow. In January and February, hazel has gradually lengthening catkins – the familiar ones known as lambs’ tails. These are often the first flowers you see at that time of year. What you may not realise is that these are only the male flowers. There are little female flowers too, which usually come in February. They are tiny red spray-shaped flowers growing from a bud. These receive the wind-blown pollen from the male catkins and become hazel nuts. Flowering this early in the year, the tree cannot rely on insect pollination, so it is wind-pollinated. The nuts used to be a major food source for country people, gathered in August or September before the squirrels get them all! Squirrels love them of course, as do some birds, especially the nuthatch. This little bird will take the nut to a crevice in a tree, wedge it there and bang away with its hard beak until it gets into the sweet flesh of the nut. Squirrels take them away and store them, thus helping them to grow and spread when the squirrels forget where they are! For humans, they were eaten raw or roasted, or ground to make a flour, and they are very delicious. They were bred to produce bigger and better nuts, the various kind of cobnuts that used to be in orchards throughout the country, and which are still sold in autumn at some local farmers’ markets. The nuts could be eaten green but were more often stored until October/ November. Sometimes there were celebrations around Samhain (Halloween) at which the new season’s nuts were eaten. From September onwards the leaves of hazel turn a beautiful golden yellow. They are quite rounded, and when they fall look like those gold chocolate coins we used to have at Christmas! At this stage you can already see the tiny catkins getting ready to grow for the next year. A coppiced hedge will grow rapidly, and within a few years will be ready for laying. Hazel takes well to laying, along with hawthorn. It’s the best way to get a thick hedge, as hazel naturally grows quite thinly. It’s quite unusual to find a hedge of pure hazel like the one we have had coppiced at the Lime Kilns site at Tardebigge. More usually they are interspersed with other trees like elder, ash, maple and oak. These crafts, coppicing, laying and using hazel, have been revived a lot recently, and we have a local hazel coppicer, Dave Ward, in Alvechurch, as well as local farmers like Adrian Bytom who coppice and lay hedges in the proper fashion. Good managing of hedges is so important for the ecology of the area. One of the other Celtic “trees” connected to this time of year is heather. It may seem odd to us to think of heather as a tree, but of course there is really no technical definition of a tree – it’s just a big woody plant. Heather can grow quite big and woody, and in some places abroad is used for hedging. It is uncommon around here as it likes acid soil, not our Midland clay. However, it can be found elsewhere in Worcestershire – near Kidderminster, around Hartlebury and Bewdley, where there are old heathlands, and a little on the Lickeys. It’s not too far to Kinver Edge which has glorious heather. 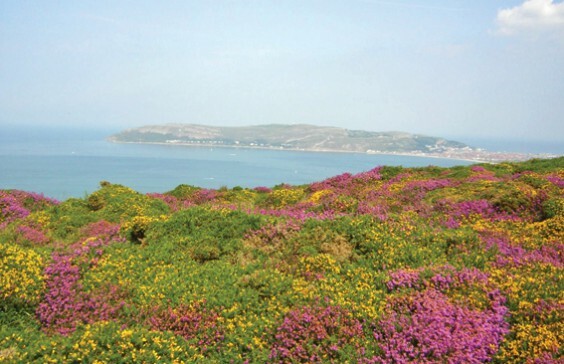 Of course, it covers vast acres of moorland and mountain in the north and west of the UK. It’s a sign of “poor soil”, which is not suitable for much agriculture, but not poor for the things that like growing on it! August is the time for heather to flower, and it makes the whole hillside purple. Occasionally it comes white, which is considered lucky. There are several different kinds of heather. The commonest is ling, but cross-leaved heath and purple or bell heather are also common. There are other rarer local types, and I have found St Dabeoc’s heath in Connemara. They are in the same family as the bilberries and blueberries which grow in similar locations. Heather was used for bedding and brooms and anywhere you needed something long-lasting, springy and shock-absorbing. When it’s young, animals can feed on it, and bees love the flowers – in fact it’s one of the most-used nectar producers for bees, and the honey is much-liked. On grouse-shooting moors the heather is often burnt, which is not very good for the environment or health. Burning or “swaling” used to be quite common to get a fresh growth of young plants for animals to feed on, but it damages the habitat and releases polluting particles. Recent wildfires on the Pennines show how much damage fire on a moorland can do. Heathland, which takes its name from heather (or perhaps vice versa) is becoming a rare habitat in central and southern England. In some places conservation groups are trying to re-establish it, and you can see this in the nature reserve near Bewdley called the Devil’s Spittleful. This kind of restoration is contentious as it often means removing native trees which have grown there as the soil has become more fertile. Naturally-occurring woodland (somewhat disparagingly called “scrub”) is also a rare habitat these days, and trees are better for the general environment than heathland. On the other hand, heathland supports some really important species, especially of butterflies but also mammals, lizards and adders. Meanwhile, enjoy the scented purple heather when you see it! I wrote this poem a couple of years ago to celebrate people in my life. There are people who put courage in you. When the others were trimming and tidying me. Brave because of a belief in other people. I was safe with a touch if I trusted. Never fearing flying again, a bird woman. When others sang with me, making harmony. And the late-night towpath, feet without fear.